Do you have any little things that make you smile from your childhood? When I was a teenager, I loved going through old magazines, especially things from the 50’s – 70’s. One of the things my stepfather collected (He loved things from the 50’s and 60’s) was old MAD magazines. While some of the stuff in these magazines I didn’t completely get at the time, I loved the old Spy vs Spy comics. Even though they didn’t have words, I found the antics of the white and black spy to be hilarious! When I was asked to review a collection of these awesome comics, I couldn’t wait for Spy vs Spy: An Explosive Celebration to arrive! Spy vs Spy: An Explosive Celebration: What is It? Looking for a comic that can easily be enjoyed by any generation? If so, we think you will love Spy vs Spy: An Explosive Celebration. For those who have never heard of Spy vs Spy, it is one of the most celebrated comics in MAD’s history, which has a very simple plot – two spies, one black and one white, outdoing one another in elaborate plots in hopes of achieving the other’s demise. Not only can you enjoy 150 of these classic comics, but they are in color for the first time! As well, you get commentary, interpretations, and fan art from some of the most well known graphic artists in the industry, including Frank Miller! With all the special features, bonuses, and other surprises, it is easy for anyone to fall in love with Spy vs Spy: An Explosive Celebration! Honestly, I have to say I absolutely love this book. It brings back not only fond memories, but the ability to see some of the best comics in the series since the 1960’s. As well, seeing many of these comics in color for the first time was also quite amazing! Since my husband had only heard about Spy vs Spy, I was excited for him to see this book for himself, and enjoy some of the fun antics that took place in the comic. If you know someone who loves comics, especially old ones, I highly recommend getting this book for them – I don’t think they will be disappointed! Based on my own experience, I am delighted to give Spy vs Spy: An Explosive Celebration an A+ rating! Want to purchase this awesome book for yourself or someone you know? 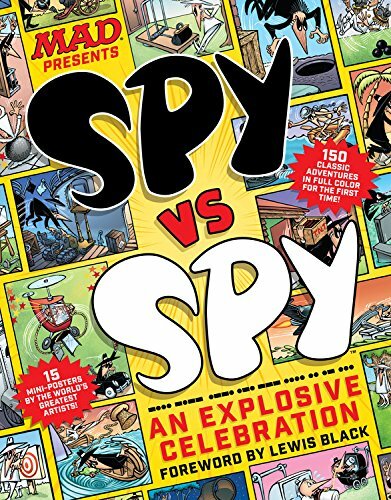 You can find a hardcover version of Spy vs Spy: An Explosive Celebration on Amazon.com for only $16.46. I don’t recall this. It sounds like something I would enjoy. I used to like the spider man and bat man comics.